I am incredibly behind on blogging, but I had to share these pictures of us telling Nora she is going to be a big sister. We knew there would be no way I could sneak a pregnancy by Laura, Margarete and Trish (not with a trip to the brewery planned), so before they came out we woke Nora up with a little present. Inside was a t-shirt that read, “big sister.” She told Chris what each letter was and he sounded them out for her, then we explained that she is going to be the big sister in January “when the snow falls.” We weren’t really sure if she got it, because she didn’t say much. But about 5 minutes later, when Chris and I were talking about something else, she asked, “What’s our baby’s name?” And after we explained that we won’t know if it’s a boy or girl until the baby comes out of my tummy, she turned to Chris with a big smile on her face and said, “Dada, when the baby comes out, I will let you hold it!” We had a good chuckle about that. I’m so excited to see Nora experience this pregnancy and meet her new brother or sister. She is definitely looking forward to it as well in her somewhat limited understanding. 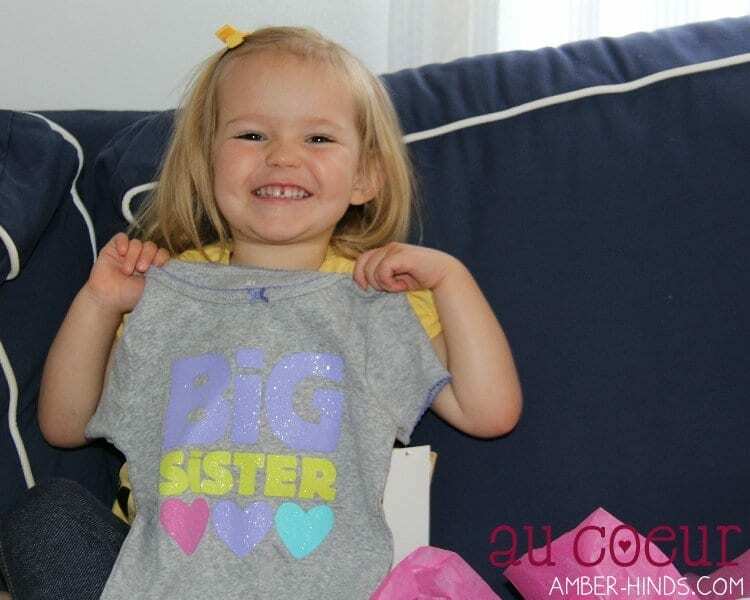 Periodically, Nora looks at me, smiling with glee, and reminds me that I “have a baby in [my] tummy and when it comes out, [she’ll] be a big sister!” Mostly, she tells me she wants a baby brother, but I think that’s only because her friend Miss E has one. She’s seen some birth videos with me (she asked to watch this one multiple times per day for weeks), and understands how babies come out and that the baby will nurse. She’s starting to learn about the whole process and asks quite a few questions. She’s already taking care of me when I’m feeling tired or sick; I know she’s going to be a great little caretaker for baby too. Next article Wordless Wednesday: Celebrating Independence…with Dada, too! That’s wonderful Nora is excited about the baby!! She is a smart and loving little girl. Have you gotten from library books about a new baby for her to look at? Hope you’re taking care of yourself getting needed rest and exercise. Are you looking for a larger home, if possible? Best of luck to you and your family!! You’ve accomplished so much. Enjoy the 4th! !